Our canine friends can sometimes experience separation anxiety when they’re away from us. It’s a common problem and one that can be addressed from a young pup age. Thanks to our friend Katrina from Kat’s 4 Dogs, we now have a few tips to help us condition our dog pals able to cope with being left on their own. Use a play pen and a crate to create distance for your puppy at home. Although we want to shower our new pup with affection – almost always! – resist the temptation to overindulge and use the play pen to contain your pup and prevent over bonding. If your pup cries when you leave the room, resist the urge to go running back, because that will show them that crying isn’t a signal for you to be together. We often feel guilty about leaving our dog when we have to go out for a while or go to work. 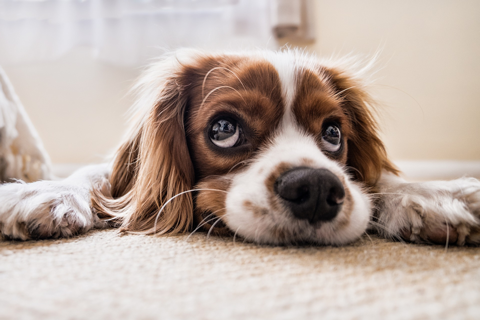 When the guilt gets us down, we tend to overcompensate by giving our pets extra attention, and rewareds even if they have been naughty in the house or yard. Sometimes just putting your dog in the backyard and not allowing her to follow you around the house will help. Try to walk your dog in the morning before you go out so that they can sleep off their exhaustion for a couple of hours after you’re gone. They – and you – have had their daily exercise and it reduces the time they feel they don’t have you around. If your dog doesn’t have a playmate, then leave toys and activities for them to do and explore while you’re away. There are interactive dog toys on the market that keep your dog occupied with little bursts of reward treats. This will ensure your pet continues to be stimulated while you’re away. If you believe that your pet is suffering from separation anxiety, seek advice from a professional. Anxiety in dogs is one of the hardest things to work with but with patience, persistence and hard work you can help your dog overcome it.